Ask 10 people around you to name a brand. I’m sure you will get answers like Coke, Levi’s and Starbucks, or even Fender and Apple. But brands can be as simple as, well, you. You are a brand. I am a brand. We have a personality and life experience and other things that people think of when they hear our name. Some people will think good things and others, I’m sure, not so good. It’s your job to “brand” yourself. If you want people to like you, then you brand yourself in a certain light. Simple? So, to answer the “simple question” is actually… simple. Brands need to communicate. Pure and simple, you need to communicate your personality, a feeling, a quality, in a simple, believable way. Stepping back and understanding the core behind the brand is sometimes the hardest thing to do. It’s subconscious. Look at those brands I listed above again and compare them to you. When you think of them you might see a logo or a cup or even a guitar shape in your head, but subconsciously you think of what is behind it. A great taste, a feeling or an experience that you can’t put into words. When I think of my best friend there is no logo in my head, but a simple feeling. If I made a tagline for my best friend it might be: “Trusted. 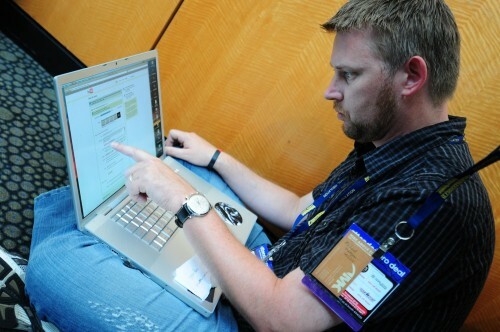 Loved and Respected.” Hell, my best friend doesn’t have a logo, brochure or even a website. That’s good branding of a brand. So next time someone asks you to name five brands… put you on the list. 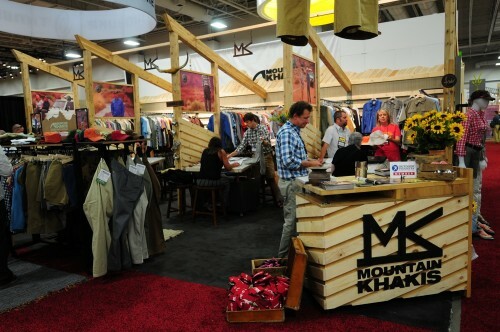 We’re at the Outdoor Retailer Show this week, hanging out with the crew from Mountain Khakis. 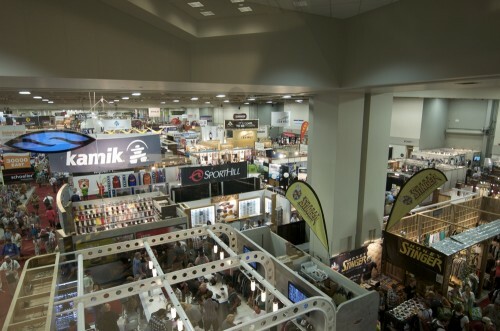 Stop by their booth and say “hello” to us if you get a chance. For the past five years I’ve been working on a new lighting technique that I call light painting. Traditionally one uses strobes or even hot lights for photography. Well, my new technique instead involves a $5 flashlight from Ace Hardware. Be it large sets like buildings and landscapes or micro-sets like food or small tables, I’ve used my technique successfully. It’s a process that requires visualizing what you want the final shot to look like, as well as a good amount of Photoshop work. Large outdoor scenes (like a building) as well as small tabletop scenes (like appetizers) both have the same challenge. The only difference is the size of the light you use. Without getting into too much detail, “painting with light” is just like it sounds. As an example, take this shot below. The above photo represents how the property actually looks. The sun was down and the camera was set to 0.4 second shutter speed, 200 ISO, and an aperture of f/6.3. Now, here is the light-painted shot. 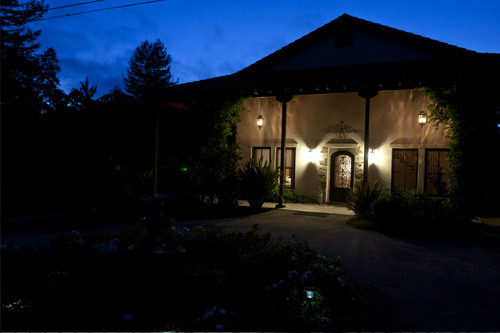 Both of the above photos are of a property out in California that I recently photographed. The challenge with this particular shot was to make it look different than any others of the house and also hide the things that you don’t want to see, like neighboring houses and drooping plants, all while highlighting other amazing details. The final light-painted shot actually consists of 23 separate photos. 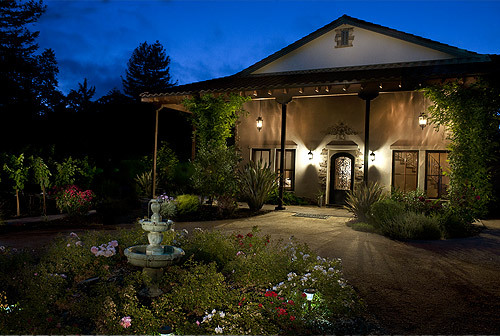 We wanted to highlight the roses and grape vines on the left… so we painted them with light. We also used the technique on the fountain, the curved drive, roofline, sky, bushes, windows, etc. If you look closely, you will see no strobes and really no landscape lighting in the photograph. That’s because there isn’t any on the property. The effect comes from just my lighting technique. Painting with light is an amazing way to highlight specific areas of a scene and capture images that the eye cannot normally see. Note: this is NOT a HDR effect. Here is another shot done with the same light painting technique, but on a micro-set. This shot was done for Marcus Hotel & Resorts at CLEAR inside InterContinental Milwaukee. This shot was actually made up of 13 different photos. Jim Rude, my food stylist on the shoot, helped bring it to life. He found it interesting on how we shot this; during the shoots, my technique can look kind of odd. I get a lot of, “is that a flashlight?” But hey, we—and our clients—always love the end result.